Share market TODAY: Snapping a six-day gaining streak, Sensex and Nifty slipped into the negative territory on Tuesday tracking weakness in Asian peers, a surge in crude oil prices and heavy selling pressure in most financials, auto, FMCG and realty stocks. According to market observers, caution prevailed ahead of the outcome of the Reserve Bank of India's (RBI) monetary policy meeting tomorrow. Share market HIGHLIGHTS: Sensex and Nifty — the benchmark indices of the domestic equity market — snapped their six-day gaining streak and closed lower on Tuesday tracking weakness in Asian peers, a surge in crude oil prices and heavy selling pressure in most financials, auto, FMCG and realty stocks. According to market observers, caution prevailed ahead of the outcome of the Reserve Bank of India’s (RBI) monetary policy meeting tomorrow. The BSE Sensex closed 106.69 points or 0.29% lower at 36,134.31 points. 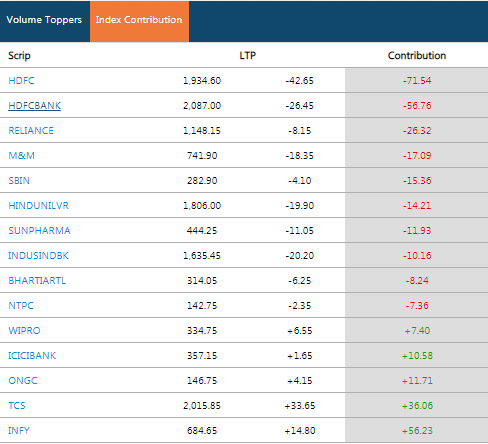 Sun Pharma, M&M, HDFC, SBI, NTPC and InduInd Bank were the top Sensex losers today. On the National Stock Exchange, the Nifty closed Tuesday’s trade 14.25 points or 0.13% lower at 10,869.50 points. Bank Nifty ended lower by 0.61%. 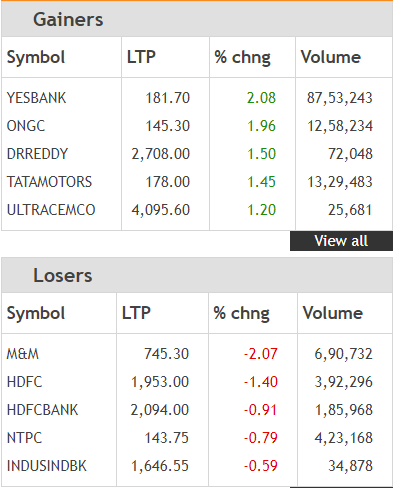 BPCL, ONGC, UPL, Indiabulls Housing Finance and IOC were the top gainers on the Nifty, while Sun Pharma, M&M, Grasim, HDFC and SBI were the top losers. Globally, deflating hopes of a swift resolution to the Sino-U.S. trade war knocked world stocks off three-week highs on Tuesday, while growing fears the U.S economy could be headed for recession sooner than expected weighed on the dollar, said a Reuters report. Following declines on Asian bourses, where Japan’s Nikkei stock index closed 2.4% lower, the mood was sombre in Europe with the wider blue-chip index slipping 0.3%. Frankfurt’s DAX and Paris’ CAC 40 fell 0.6% while MSCI’s index of world stocks declined 0.1%. Stock markets in India drifted lower in early trade as profit booking emerged on the bourses after six straight days of gains. Stocks were trading in a small range with a negative bias for most of the day. Investors remained cautious ahead of the outcome of the Reserve Bank of India's (RBI) monetary policy meeting. The Monetary Policy Committee (MPC) will conclude its two-day meet tomorrow, 5 December 2018. The resolution of the MPC will be announced on 5 December 2018. Global stocks were trading mixed following Monday's jumps across the region, signaling fading investor applause for the US-China trade truce. Sectoral performance on the National Stock Exchange (NSE) was mixed. The NSE Nifty closed Tuesday's trade 14.25 points or 0.13% lower at 10,869.50 points. 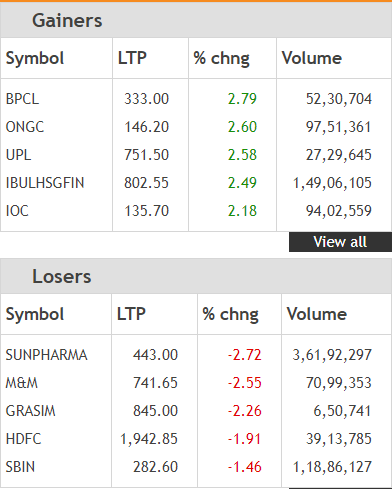 BPCL, ONGC, UPL and Indiabulls Housing were the top gainers today, while Sun Pharma was the top loser. Sun Pharma shares failed to retain morning gains and slipped nearly 3% to a low of Rs 442 per share on the BSE. Earlier, Sun Pharma shares rose over 2% in early morning trade after the drug major said it has not received any query so far from the markets regulator Sebi regarding a whistleblower complaint regarding alleged irregularities by the company. Shares of the company rose by 2% to a high of Rs 464.70 per share on the BSE. Shares of Sun Pharmaceutical had dived 7.5% on Monday after reports said markets regulator Sebi may reopen an insider trading case against the firm and probe alleged lapses by some of its promoters. HDFC and HDFC Bank were the top drags on the Sensex today. Both the scrips collectively wiped off nearly 125 points from the headline index. HDFC twins were followed by Reliance Industries, M&M, SBI and HUL. On the other hand, Infosys, TCS, ICICI Bank, ONGC and Wipro contributed to the Sensex. Just ahead of the final date to get physical shares of listed companies converted to demat, capital markets regulator Sebi has extended the deadline till next year. The Securities and Exchange Board of India (SEBI) on Monday said the last date for dematerialisation of physical shares has been extended from December 5 to 2019. The regulator said the final date has been extended after taking into consideration representations from shareholders. The BSE Sensex trimmed some gains to trade at 36,159.82 points, down 81.18 points or 0.22% from its previous session's close. Earlier in the morning, the index fell over 150 points to a low of 36,070.63 points. 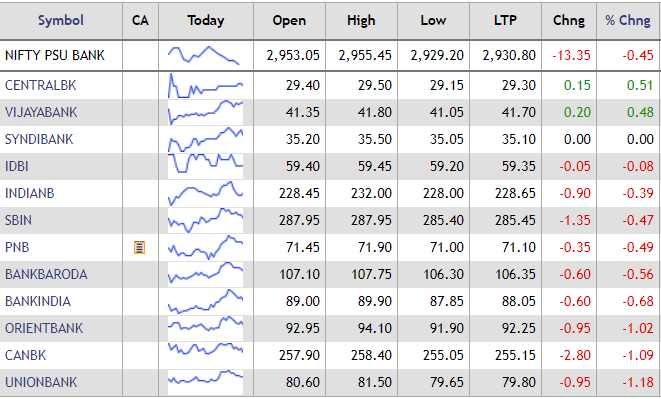 ONGC was the top gainer, up over 3%, while Bharti Airtel was the top loser during the mid-afternoon traded deals. A high-level panel on Tuesday recommended market regulator Sebi to allow direct listing of Indian companies on overseas bourses and of foreign firms on Indian exchanges, said a PTI report. Currently, Indian companies can list their shares through depository receipts abroad, while foreign companies need to go through the Indian Depository Receipt route for listing of equities. Moreover, Indian firms can list their debt securities directly on international exchanges through a security instrument known as 'Masala Bonds'. In its 26-page report, the committee has suggested for direct listing of Indian companies overseas and vice versa. It has recommended that the framework should allow listing only on specified stock exchanges in 'Permissible Jurisdictions'. Oil prices rose on Tuesday, extending bigger gains from the previous day amid expected OPEC-led supply cuts and a mandated reduction in Canadian output. U.S. West Texas Intermediate (WTI) crude futures were at $53.33 per barrel at 0604 GMT, up 48 cents, or 0.7%, from their last close, said a Reuters report. International Brent crude oil futures were up 51 cents, or 0.8%, at $62.20 per barrel. Both crude benchmarks climbed by around 4% the previous session after Washington and Beijing agreed a truce in their trade disputes and said they would negotiate for 90 days before taking any further action. Shares of India Cements gained 2% in early morning trade today after the company said it has bought a controlling stake in Springway Mining. According to a BSE filing on Monday, the company has acquired the controlling stake of 51% in the paid-up equity share capital of Springway Mining. At the time of reporting, India Cements shares were trading 2.57% lower at Rs 94.70 per share. Drug firm Alembic Pharmaceuticals on Tuesday said its subsidiary has received the US health regulator's nod for Glycopyrrolate tablets, used in the treatment of peptic ulcer. The company's wholly owned subsidiary Orit Laboratories LLC has received approval from the US Food & Drug Administration (USFDA) for its abbreviated new drug application (ANDA) Glycopyrrolate tablets USP in the strengths of 1 mg and 2mg, Alembic Pharmaceuticals said in a BSE filing. Alembic Pharma shares were trading 0.47% higher at Rs 618.55 per share on the BSE. The dollar slipped in Asia on Tuesday as U.S. Treasury yields fell to three-month lows, a sign some investors were wagering the Federal Reserve would slow the pace of its rate hikes, said a Reuters report. The weakness in the dollar comes against the backdrop of a temporary truce in the US-China trade conflict, which has bolstered investor confidence in riskier currencies versus the safe-haven greenback. The U.S. 10-year Treasury yield fell to 2.94% on Tuesday, its lowest level since mid-September. The difference in yield between the U.S. 2-year and 10-year tightened to its smallest since July 2007. Weak global cues and heavy selling pressure in financials, auto and realty indices dragged the NSE Nifty lower on Tuesday. 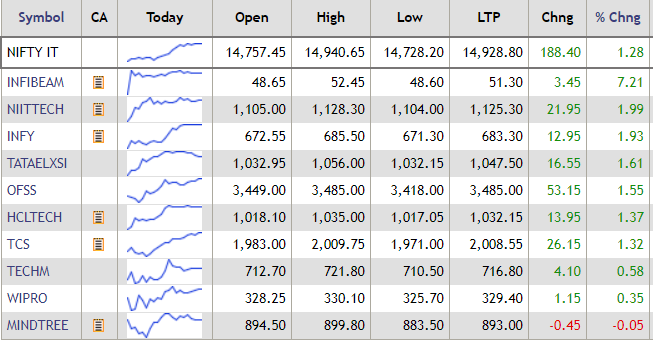 Among the sectoral indices, the Nifty IT, pharma, metals and media indices traded in the green. After India’s largest FMCG giant HUL announced a mega merger with GSK Consumer, picking up the iconic Horlicks and Boost brands, brokerages see a lot of positives for HUL from the deal. Interestingly, HUL shares have gained by about 4.2% from Friday’s closing price of Rs 1,774.3. HUL share priced gained 1.2% to hit a fresh 52-week high of Rs 1,848.95 on NSE this morning. Taking stock of the mega deal, Deutsche Bank said that the merger will provide a boost to earnings for HUL. The deal is seen to be margin and EPS accretive by 5% in FY20. The company can unlock significant scale and synergy benefits on costs. Deutsche Bank has upgraded the share price target to Rs 2,100. HUL shares are trading at about Rs 1,813.10. Deutsche Bank’s target price implies an upside of more than 15% from the current market prices. The Nifty IT index traded with gains today, with shares of Infibeam Avenues up over 7% during the mid-morning trade deals. Mindtree was the only loser on the IT index. Infosys and HCL Technologies gained over 1% each. Welspun Enterprises shares jumped over 3% in early morning trade today after the company said it has inked a pact with National Highways Authority of India (NHAI) for a Rs 2,005 crore highway project in Tamil Nadu. Shares of Welspun Enterprises rose 3.33% to a high of Rs 114.80 per share on the BSE. "NHAI and Welspun Sattanathapuram Nagapattinam Road Private Limited (WSNRPL), a subsidiary of Welspun Enterprises Ltd, have executed the Concession Agreement on December 3, 2018 for four-laning of Sattanathapuram to Nagapattinam section of NH-45A (New NH -332) in Tamil Nadu," the company said in a regulatory filing to the BSE on Monday. Gold prices rose on Tuesday, after hitting a more than one-month high earlier in the session, as the dollar stumbled after the United States and China agreed to a temporary truce in their trade conflict that rattled global markets, said a Reuters report. Spot gold climbed 0.4% to $1,235.78 per ounce at 0400 GMT. Prices touched a peak of $1,236.01 earlier in the session, their highest since November 2. U.S. gold futures were little changed at $1,240.3 per ounce. The BSE Sensex snapped its six-day gaining streak and slipped into the negative territory on Tuesday tracking weakness in Asian peers and a surge in crude oil prices. Around 10.15 am, the Sensex was trading at 36,129.25 points, down 111.75 points or 0.31% lower. HDFC slipped nearly 2% on the index, while HDFC Bank shares were trading lower by over 1%. The rupee depreciated by 9 paise to 70.55 against the US dollar in early trade Tuesday at the interbank foreign exchange, amid strengthening of the US dollar and rising crude oil prices. Fresh demand for the American currency from importers amid rise in crude prices weighed on the domestic unit, PTI reported quoting forex dealers. Besides, investors were treading the cautious path ahead of the RBI policy decision. The rupee opened lower at 70.50 a dollar and dropped further to quote at 70.55, 9 paise down over its previous close. On Monday, the local unit snapped its four-day rising streak and dropped by 88 paise, its biggest single-day loss in more than three months, to close at 70.46 against the US currency. Asian shares fell on Tuesday as a relief rally petered out amid rising doubts over whether China and the United States will be able to resolve trade differences. An inverted U.S. yield curve also raised concerns about a possible recession. MSCI's broadest index of Asia-Pacific shares outside Japan fell 0.3% as Chinese equity markets struggled to move out of negative territory. Chinese blue-chip shares in Shenzhen and Shanghai were slightly weaker, and the benchmark Shanghai Composite index edged barely higher. Shares in Hong Kong lost 0.3%. Australia shares gave up 0.8% and Seoul's Kospi fell 0.6%, while Japan's Nikkei stock index was 1.3% lower. Sun Pharma shares rose over 2% in early morning trade today after the drug major said it has not received any query so far from the markets regulator Sebi regarding a whistleblower complaint regarding alleged irregularities by the company. Shares of the company rose by 2% to a high of Rs 464.70 per share on the BSE. Shares of Sun Pharmaceutical had dived 7.5% on Monday after reports said markets regulator Sebi may reopen an insider trading case against the firm and probe alleged lapses by some of its promoters. Shares of Yes Bank surged over 2% to a high of Rs 182.50 on the BSE in early morning trade today after the bank announced the appointment of T S Vijayan, former Irdai chairman, as an additional director for five years with immediate effect. "We would like to inform that the board of directors of the bank on December 3, 2018, have approved the appointment of T S Vijayan as an additional director (independent) of the bank with immediate effect and his appointment as independent director for a period of 5 years...," the bank said in a regulatory filing on Monday. The NSE Nifty, after opening marginally lower, extended losses and traded lower by 15.65 points or 0.14% at 10,868.10 points. Yes Bank was the top Nifty gainer, up 2%, while M&M slipped over 2% and was the top Nifty drag. Sensex and Nifty opened marginally lower on Tuesday tracking weakness in Asian peers and a surge in crude oil prices. The BSE Sensex was trading 3.98 points or 0.01% lower at 36,237.02 points in opening trade, while the NSE Nifty 50 traded at 10,880 points, down 3.75 points or 0.03%. The rupee slipped 5 paise to open at 70.51 against the US dollar. Share market on Monday: Extending gains for the sixth consecutive session, Sensex and Nifty — the benchmark equity indices closed trade in the positive territory led by gains in most metals, pharma, PSU banks, IT and FMCG stocks. The BSE Sensex closed Monday’s trade 46.70 points or 0.13% higher at 36,241 points. The NSE Nifty was just shy of the 10,900 mark and closed 7 points or 0.06% up at 10,883.75 points. 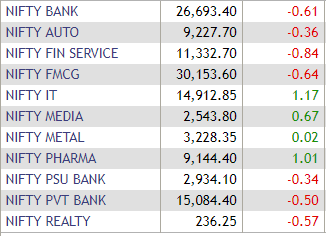 Yes Bank was the top Sensex gainer, while Sun Pharma was the top drag, down 7%. On the NSE, Indiabulls Housing Finance was the top Nifty gainer.